Do the words above sound familiar? They are a take-off of the slogan that has motivated the socialist, Leftist movement since WWII. The Long March refers to Mao Zedong’s grueling year-long march in 1934/35 with his Peoples’ Liberation Army around the rocky periphery of China to eventually overcome the Nationalist forces and establish the current Chinese Communist state. “Long March” has become a metaphor for long-lasting struggle through many hardships, resulting in final victory. The basic slogan came from two Italian socialist activists, who noted that violent revolutions were of the past, that from then on (Say beyond WWII) the socialist state could only be achieved by long, persistent burrowing into existing institutions of the West—a Long March. It is the social institutions of the West through which this new Long March has been taking place: the various arts, movies, television, education, universities, foundations, think-tanks, and even political organizations and government—any community that espouses principles and local beliefs that can lead to “subversive” behavior, as seen by Leftists. Infiltration should be surreptitious, from within, using the mechanisms of the social institutions themselves and just redirecting their products. Any subterfuge can be used in this rightful cause. The word “subversion” was self-applied and encouraged. But what was supposed to be put into place in the Institutions? A total Socialist/Communist/Collectivist (say “Leftist”) society in the West, primarily in the United States. Why is a Leftist society different from the society they are trying to replace? Let’s call our traditional society Capitalism, which is a dirty word among Leftists—shades of Daddy Warbucks and rich people lording it over the downtrodden poor—certainly the opposite of collectivist. What is there about Capitalism that turns all these Leftists off and puts them into destruction mode? Capitalism is based on the Rule of Law, in particular on personal liberty law and property ownership law. The Rule of Law is our inheritance from earlier Western society, and it is an outgrowth of Judeo/Christian teachings and principles. The Founding Fathers took God’s existence and power, expressed in a Judeo/Christian manner, for granted. The Declaration of Independence and the Constitution demonstrate this. The Left cannot abide Capitalism; it runs counter to their own fundamental principles. Hence the Long March, which is making great progress. We can see the intended deviations from the Rule of Law all over. Anything that runs counter to socialism is fair game: restrictions on what should be accepted as art, healthy TV and movie entertainment, enforcement of the Constitution, especially the Bill of Rights. All the good things about our country that stem from Capitalism and the Rule of Law are under siege. And the more we all allow political correctness and its family of social perversions to abide, the more we lose our own God-given rights under the Rule of Law. Leftist projects are almost always cloaked in good-sounding descriptions. Thus preferential treatment of blacks for college admission is described as “only fair, considering how the blacks have been treated.” No notice is taken of the violation of the right of the smart Caucasian student to win an entrance based on their merits. Of course it is not seen that way, much less discussed in those terms, by the Leftist leaders of the Institutions. We are in a war here—a fact known and espoused, but not advertised, by the Leftists and not even known by the rest of United States citizens. The Leftists continue to win as long as they can keep the rest of the people anaesthetized as to what is happening. As long as the non-Leftist citizenry of the West continues with its head in the sand, so much harder will it be to win the war with the Left. This whole non-Leftist citizenry will have to march the country back through the institutions the same manner as have the Leftists. This will be a long, grueling fight on many fronts. But it must be undertaken. The Leftists will not give up until and unless they are conquered. Yes, conquered—we use an expression reminiscent of war because it is a war: either we win or they do. And they will not stop. 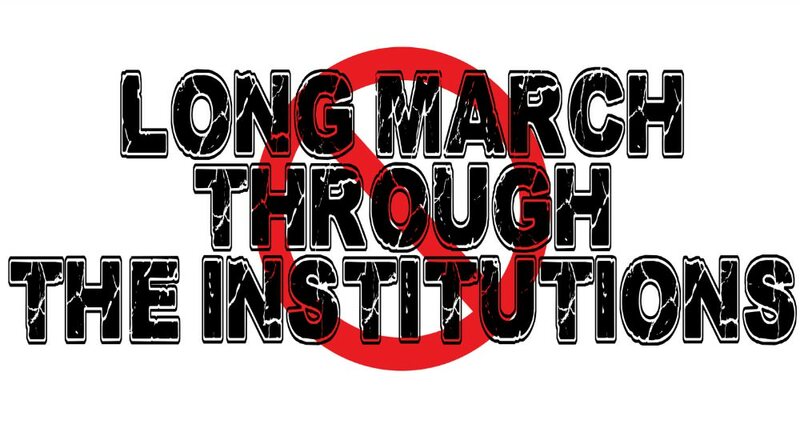 We had better get started on the Long March BACK Through the Institutions!